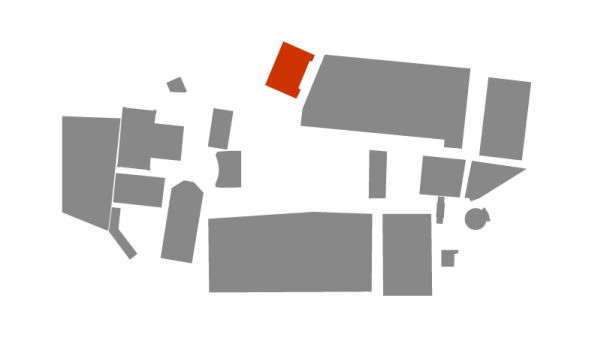 Compared to all the other buildings on the modern-day excavation site of the Forum, the Curia is the building in which the largest percentage of ancient construction material has been conserved. Thus, the Curia gives us the best impression of the scale and monumentality of the architecture that once stood on the Forum during the Imperial Period. 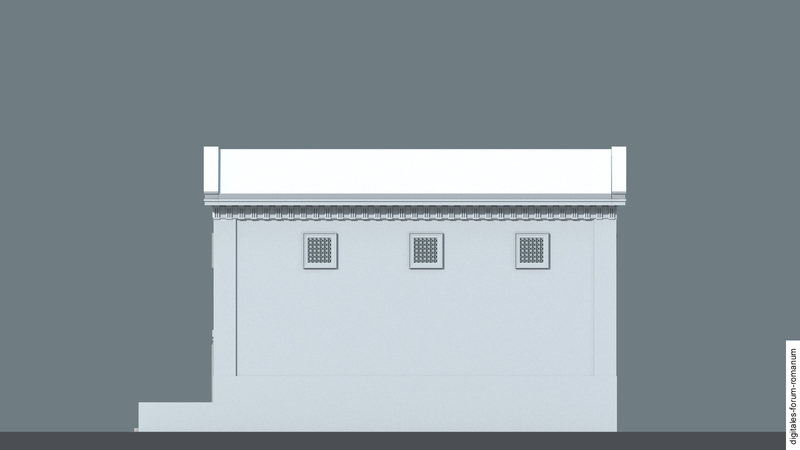 The building that can still be seen today (on the excavation site) is based upon a modified structure from the Tetrarchy at the end of the 3rd century A.D. 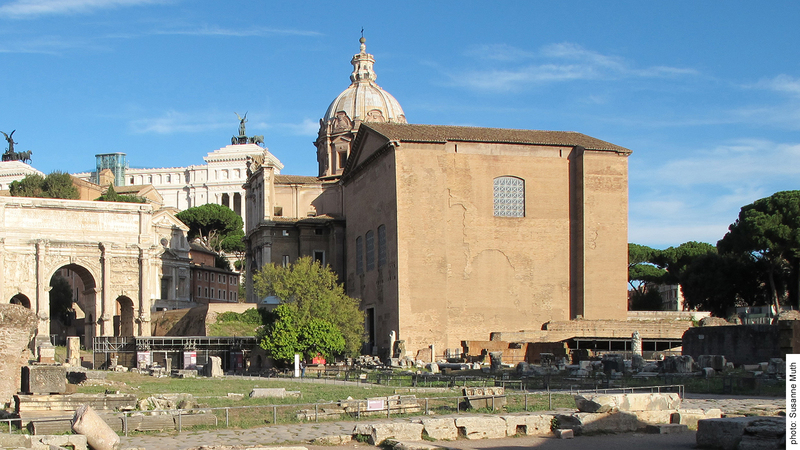 The beginnings of the Curia, however, date back to the early period of the Forum. 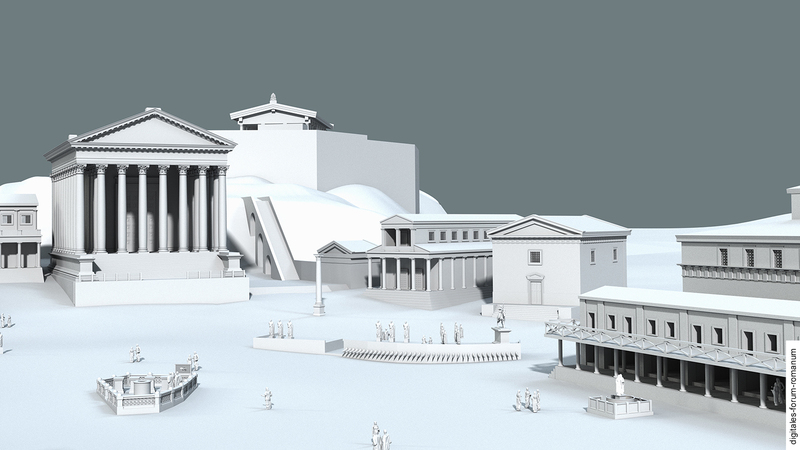 Since the Regal Period the building where the Senate convened stood at the north-west corner of the Forum. 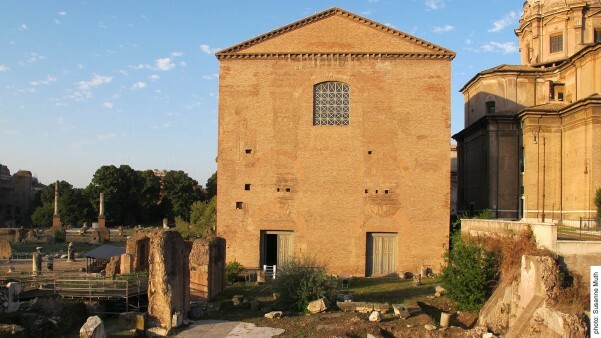 This building, which was called the Curia, and the Comitium, which housed the People’s Assembly, constituted the centre for political decision making and communication in Rome. The long history of the Curia reaches from the Regal Period to Late Antiquity and is characterised by many structural modifications, extensions and spatial movements. In contrast to most of the other buildings on the Forum the Curia’s history does not come to an end after antiquity: In the 7th century A.D. the building was converted into a church and this prevented it from being destroyed in later periods. The structural modifications that the church underwent in the Middle Ages and the Baroque period were removed again in the 1930ies and the ancient architecture was restored to its appearance from the Tetrarchy (for images of the present-day ruin, see below). 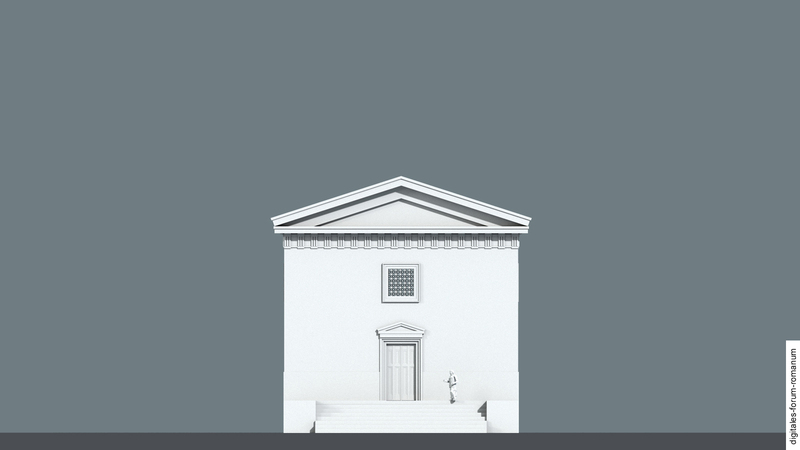 The Curia is a paradigmatic example that reveals the close and diverse connections between constructional and political history. 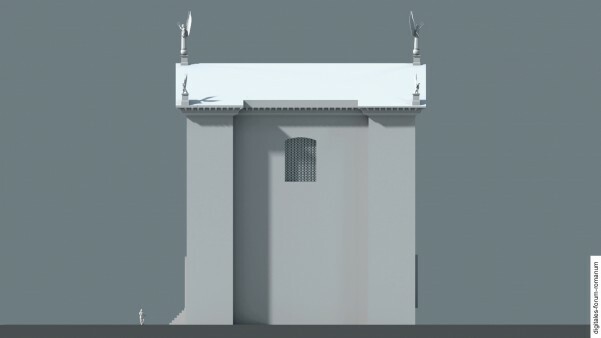 In order to characterise this relationship more clearly, it is necessary to give a more detailed overview of the history of the building, before examining the individual construction phases (for the individual phases, see below). Roman writers of the 1st century B.C. ascribe the founding of the Curia to the legendary third king of Rome, Tullus Hostilius. The ancient name of this building, “Curia Hostilia” (the curia of Hostilius), references this historical event. 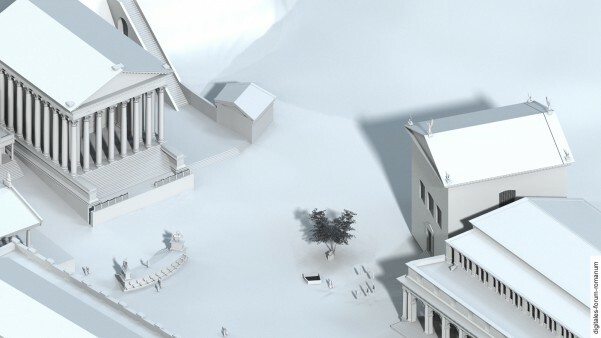 Archaeological findings that were found in the north-west corner of the Forum in the area of the Comitium verify the existence of a representational structure from the 6th century B.C. Thus it is plausible to assume that a first curia already stood here during the Regal Period which acted as the house of the Senate. While the council of elders (which was already called “the Senate”) acted as a mere advisory body when the kings still reigned over Rome, its political significance radically changed after the last king had been overthrown and the Republic established at the turn from the 6th to the 5th century B.C. From that time on the Senate was the institution where all the higher magistrates of Rome congregated after their term in office had ended. 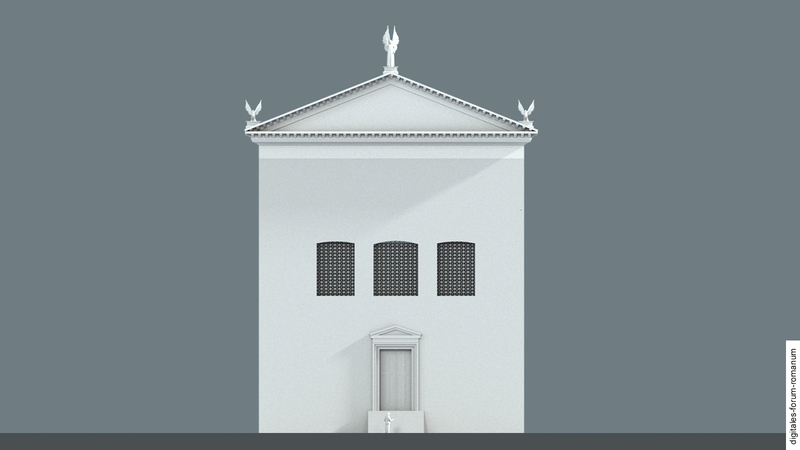 Thus, it housed the most important politicians of the Republic and it is where Rome’s fate was decided. 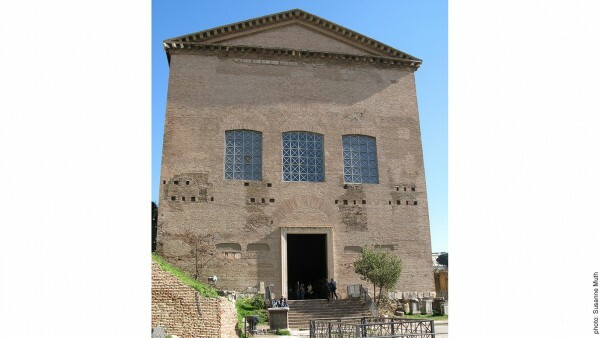 In the Curia the 300 senators convened regularly (whereby individual meetings also took place in temples such as the Temple of Concordia or the Temple of the Dioscuri). The construction of the Curia underlined this outstanding status of the Senate. 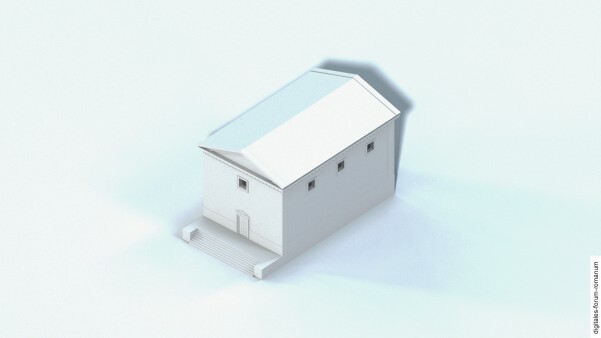 Built on slightly elevated terrain, the building dominated the Comitium which stood in front of it. From its entrance the senators were able to address the people that were gathered in the Comitium and monitor their activities there (speeches, legislative procedures, voting ceremonies etc.). When Sulla was appointed as dictator from 82 – 80 B.C. and given the task of restoring the state, he double the number of senators from 300 to 600. Because the old Curia Hostilia was unable to house 600 senators, the building had to be extended. Contemporary authors report that parts of the Comitium were destroyed in the process of extending the new Curia. It is unclear whether the name of the new Curia (“Curia Cornelia”) was derived from Sulla’s gentile name and was meant to honour him as the financial benefactor (this was common practice in Roman construction policy). In any case, scholars use this name in order to demarcate it from the older building of the Curia Hostilia – this usage of the name is independent of the ancient historicity of the name. Contrary to the preceding Curia Hostilia, the Curia of Sulla did not last very long: When the body of Clodius, an enemy of the Senate and a supporter of the Populares, was put on public display on the Forum it 52 B.C., riots erupted and the supporters of Clodius carried his body into the Curia, which they then burnt to the ground. Sulla’s son was then tasked with rebuilding the destroyed Curia. But his construction project was also doomed to fail after only a short period of time: In 44 B.C. at the latest, a new temple for Felicitas (Caesaris) was erected in the area of the Sullan Curia, while Caesar himself ordered that a new curia be built on a spot that was slightly different from the old position. With the construction of the new Forum Julium, which Caesar placed north-west of the old Forum Romanum directly adjacent to the Comitium and the old Curia, the building of the Senate increasingly turned into an attractive target of Caesar’s construction policy. When exactly, during the construction of the Forum of Caesar (54 – 46 B.C. ), he made the decision to rebuild the Curia remains unclear; however, the decision must have been made around 45/44 B.C. 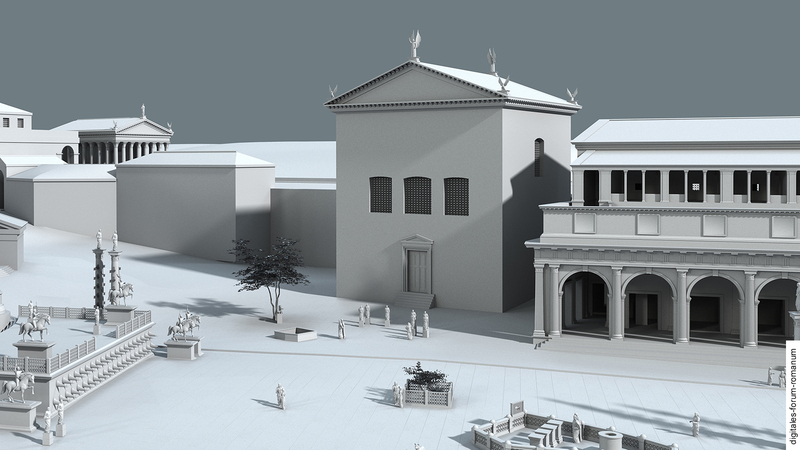 at the latest (at that time the old Rostra at the Comitium were given up and the new Rostra Caesaris were erected on the west side of the Forum). 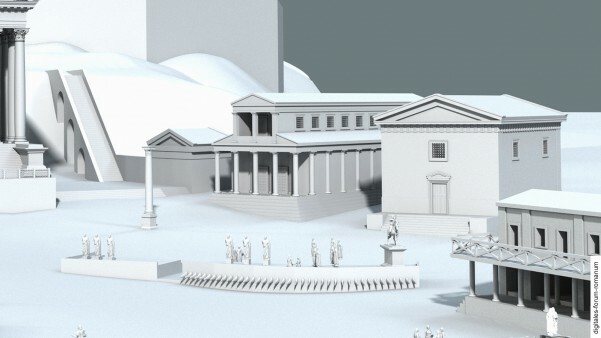 A further factor that necessitated the rebuilding of the Curia was the fact that Caesar, whose task as dictator was to restore the state, increased the number of senators yet again by 300, resulting in 900 senators in total: In order to accommodate this increase a bigger building for the Senate was required. The Caesarian Curia was called the “Curia Julia”, deriving from the gentile name of its most recent benefactor. What is striking about the Curia Julia is not only the fact that it was bigger than its predecessor structures, but that it was erected on a slightly different location, now orientated directly towards the Forum of Caesar. Thus, this building – which symbolised the Republican tradition like no other building – was perceived as the annex of the Forum of the dictator for life (dictator perpetuus). 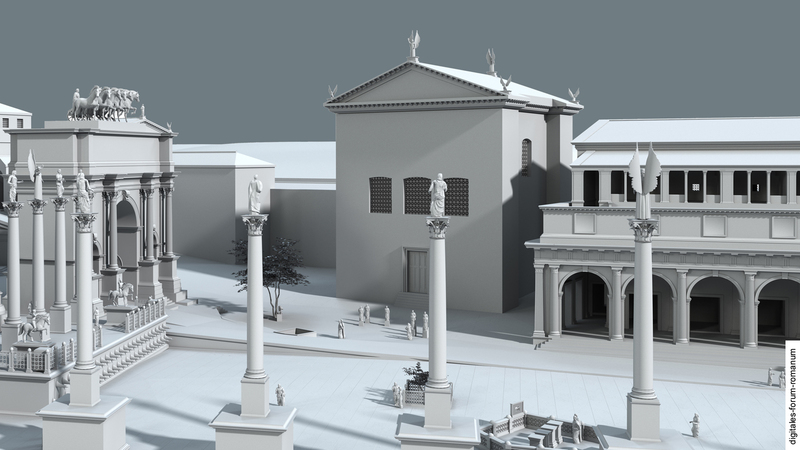 At the same time the Curia changed its relationship to the Forum: It was no longer orientated towards the south-east part of Forum with its facades, thereby dominating the open Forum area, but towards the south in the direction of the new Rostra Caesaris and the Temple of Saturn. Because the construction work on the new Curia had not advanced very far when Caesar was murdered in 44 B.C., its completion was delegated to his heirs. 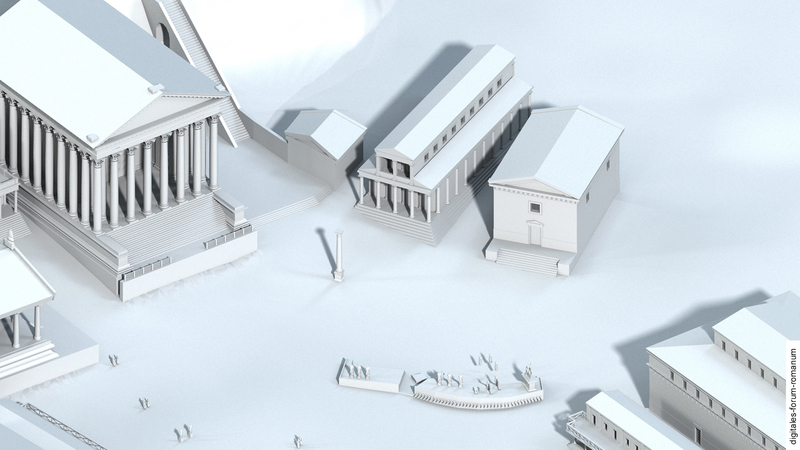 It was Augustus who finished this ambitious construction project (like many others) of his adoptive father and inaugurated the Curia in 29 B.C., together with the Temple of Caesar on the east side of the Forum. And just like the Temple of Caesar, the Curia was exploited by Augustus in order to represent his power and his victories: A statue of Victoria was erected inside of the Curia, spoils from his victory over Egypt were displayed there, an altar for Victoria was built and a honorary plate, which lauded the virtues of the new ruler, was erected there on the behest of the Senate and the Roman people: After Caesar had moved the Curia nearer to his own forum and named it after the Julii, Augustus exploited this usurpation of the Curia even further and transformed the building of the Senate into a stage for his own self-portrayal as victor and ruler over the world. However, Augustus lowered the number of senators from 900 (which Caesar had decreed) back to 600 senators. 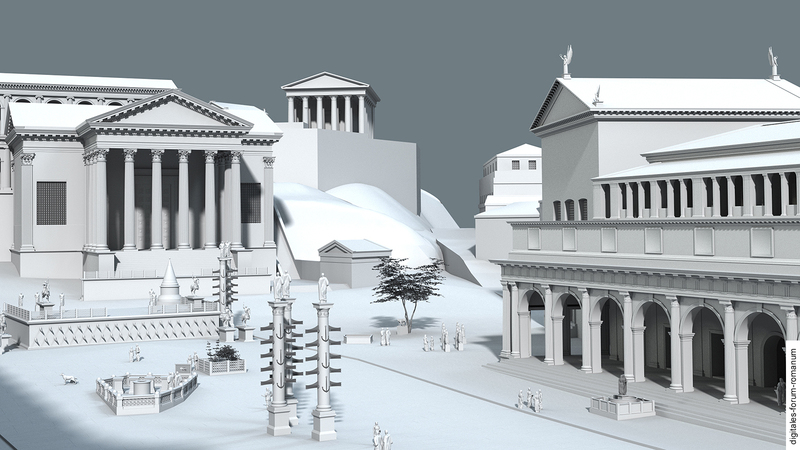 In 283 A.D. a devastating fire destroyed large areas of the north-western part of the Forum, including the Curia. Diocletian rebuilt it largely in the fashion of the Caesarian-Augustan predecessor structure. This rebuilding of the curia during the Tetrarchy forms the structural basis for the ruin that is still visible on the Forum at the present day. Analogous to the complex history of the Curia is its complex reconstruction in terms of individual construction phases. The newly constructed building of the Curia from the Tetrarchy, which is still visible today, can be reconstructed with a high degree of accuracy, because of its ideal preservation (in comparison to other structures). The only things that have survived from the Caesarian-Augustan Curia are the foundational walls on the east and north side, which merely allow us to come up with an extremely provisional reconstruction of the upper architecture; what is helpful in this respect is the depiction of the Curia on a contemporary coin. 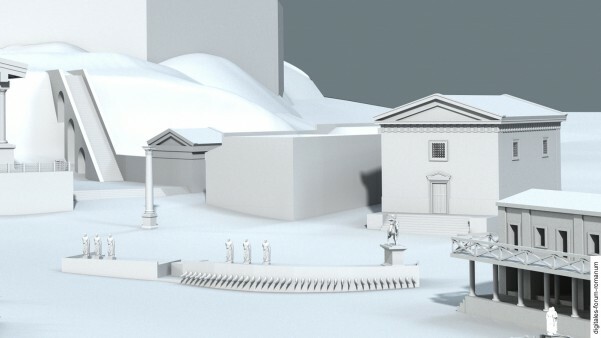 Far more problematic is the reconstruction of the Curia Hostilia and its Sullan extension: The area on which they stood is buried beneath the present-day church Santi Luca e Martina and has not been excavated yet. 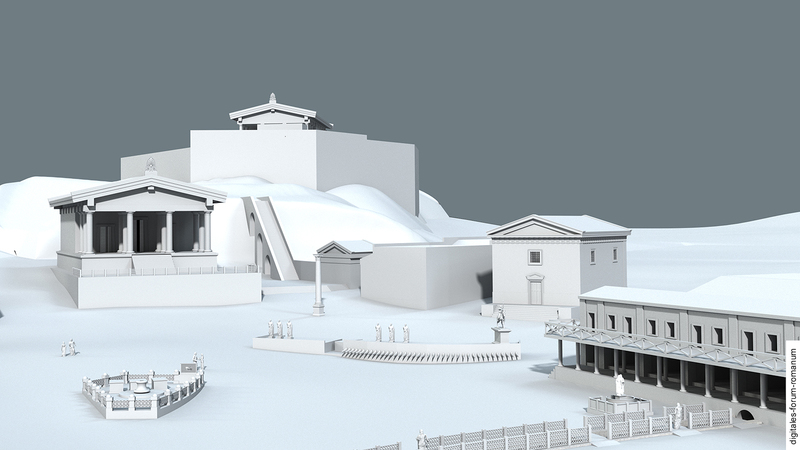 Accordingly, we have no information about the exact location, layout and upper architecture. The location and approximate appearance of the curia in question can only be reconstructed by combining different kinds of information extracted from the ancient texts. It is important to always keep the entire area in mind, because the Curia Hostilia can only be reconstructed by examining its topographical relations to the adjoining and unexcavated Basilica Porcia as well as the Comitium which also has not been excavated to a large extent. 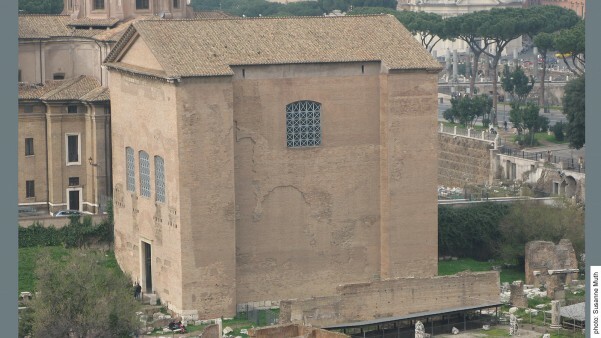 Only vague claims about the upper architecture of the Curia Hostilia are possible. 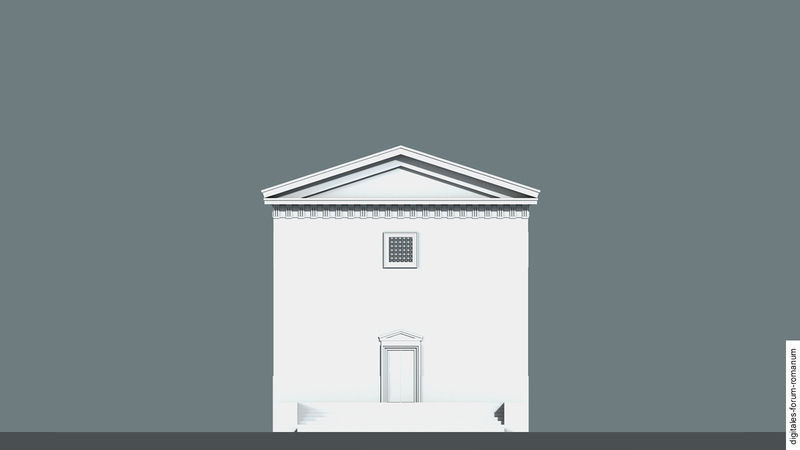 We can merely compare it to other Republican curia buildings in the Roman colonies in Italy and take into account the remarks that Vitrivius makes in his work on the theory of architecture about the ideal proportions of such Roman curias. The Curia was orientated towards the south of the Forum overlooking the Republican Rostra and the sanctuary that was situated there (the latter has helped archaeologists to ascertain the proper location of the Curia Hostilia, north of the Rostra). Between the Rostra and the Curia the assembly space of the Comitium was located. How far apart the Curia and the Rostra were from each other or where the Curia Hostilia was actually situated within the unexcavated area, can only be determined approximately: On the north side the walls of the later Forum of Caesar, which took the the proposed construction of the temple of Felicitas (which was supposed to replace the older Curia) into consideration, limited the possible area; there must have been enough space west of the street that ran there (clivus Argentarius) in order to allow Cato to erect the Basilica Porcia there in 192 .B.C. (this basilica must have been situated not too near, but also not too far away from the Curia). The location of the Curia Hostilia has to be reconstructed in such a manner that there is enough space for the structural extensions that it underwent under Sulla, who extended it southwards right into the Comitium. If one considers all of these factors, then one ends up with a pretty small and precise space where these buildings might have been located. A further factor that has to be taken into consideration for the reconstruction of the Curia Hostilia is the number of senators (300), which had to be accommodated by the interior space of the Curia, which was most probably arranged in the same manner as in the Curia Julia with two opposing rows of seats on the long sides. 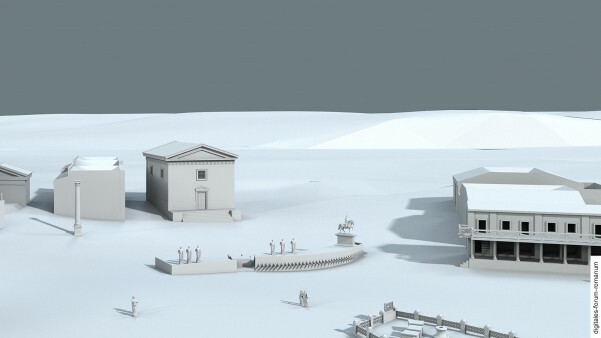 This suggests an area of about 22 x 14 m. The reconstruction of the upper architecture is based on a simplified version of the exterior of the later Curia Julia, just on a smaller scale and with a height that is estimated at about 15 m (the latter is simply hypothetical). 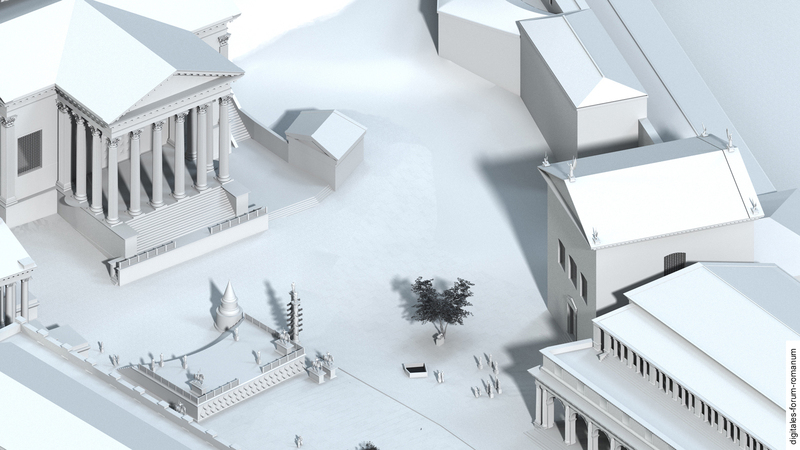 Such a reconstruction seems plausible, if one considers the pragmatic purposes that the building served as well as the fact that the successor structures inherited the basic architectural composition of this building. 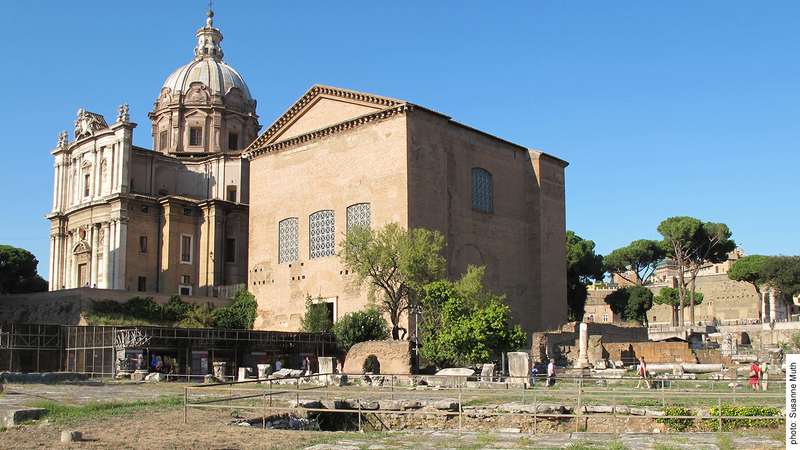 The literary sources cannot resolve the question to what extent the Curia Hostilia was restored or even rebuilt in the period ranging from the 6th to the early 1st century B.C. Because the building of the Curia persisted for a long time and witnessed a number of destructive fires, it is very probable that a various structural alterations occurred. One example of this are the remains of the roof terracottas with the archaic relief decoration, which were found at the excavation site of the Comitium and have been ascribed to the Curia from the Regal Period – they point towards this iterative process of an initial structural damage and its subsequent restoration. Ancient writers report that the Curia, whose structure had been extended by Sulla, protruded into the area of the Comitium so that e.g. 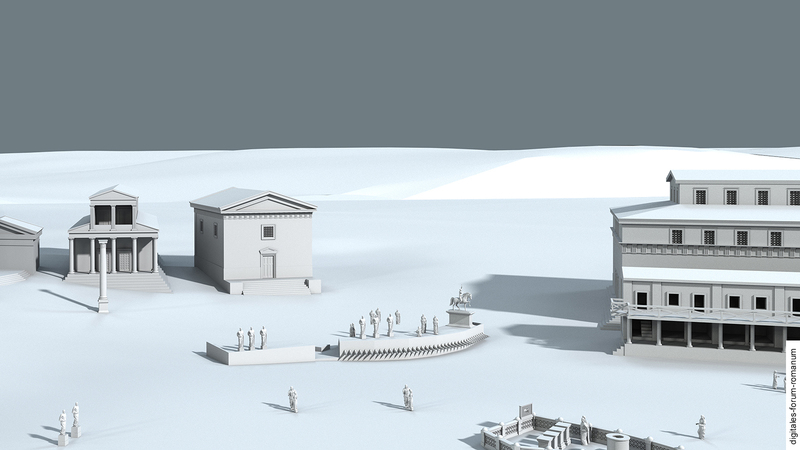 the statues that were located on the borders of the Comitium had to be removed. Within our reconstruction we have adapted the proportions of the extensions of the Curia to the overall space that would be appropriate to accommodate double the number of senators; hereby we have assumed that the extension was directed southwards and, in part, eastwards (because the Basilica Porcia was still standing on the west side). 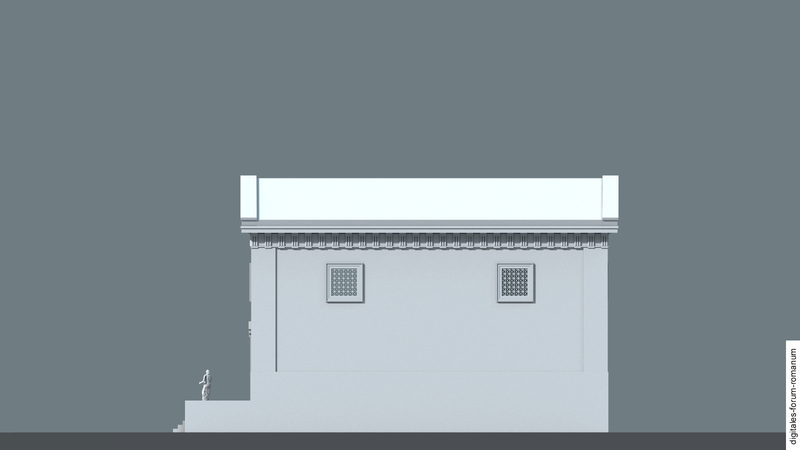 Our model is around 27 m long x 18 m wide. 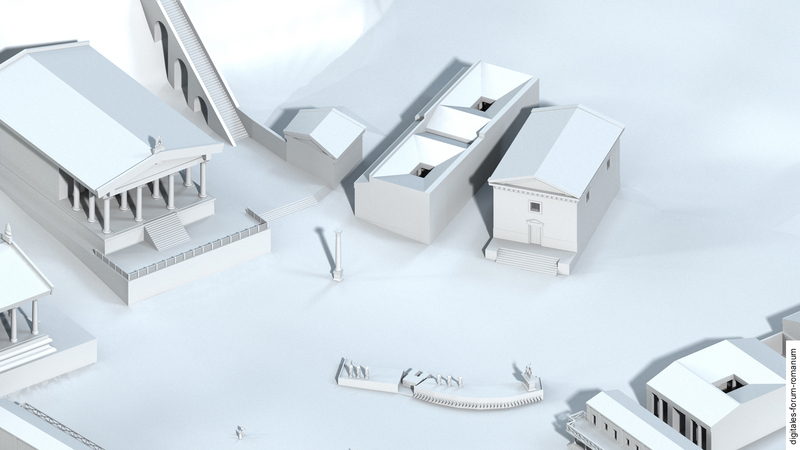 The reconstruction of the upper architecture was based on a slightly enlarged version of the upper architecture of the Curia Hostilia. 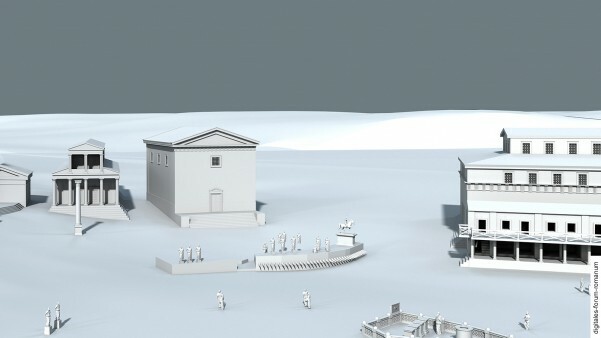 Obviously this reconstruction also remains hypothetical, because it itself was based on the hypothetical reconstruction of the older Curia Hostilia. The Curia Julia, whose construction was initiated by Caesar and completed by Augustus, can be examined more easily in the excavated area of the Forum thanks to the change in its location. The walls of the Curia that was rebuilt during the Tetrarchy rest on the foundational walls of the Caesarian-Augustan Curia so that that the layout of the former can be reconstructed accurately (28 x 23 m). 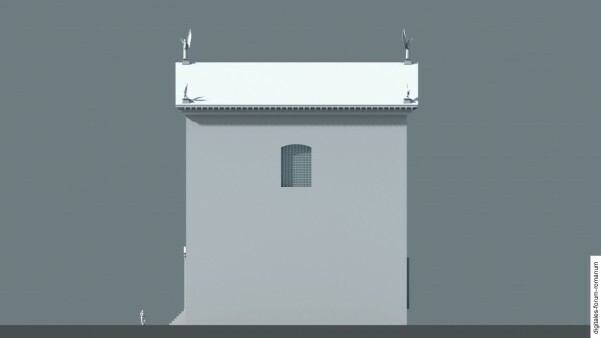 Overall, the Curia Julia was a square building that lacked some of the features of the Tetrarchic structure (the indentations on the long sides as well as the reinforcements provided by the avant-corps on the corners – these were supposed to stabilise the towering walls). Accordingly, we have assumed a height of about 30 m, just as it was the case for the successor building whose reconstruction was based on more solid evidence. 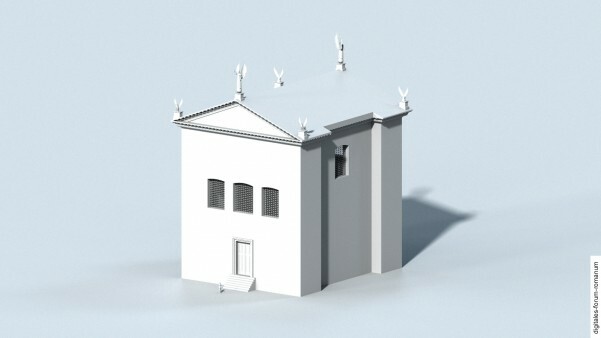 We have reconstructed the upper architecture analogous to that of the Tetrarchic structure, whilst also taking an alleged depiction of the Curia Julia on an Augustan coin (dating back to 29 – 28 B.C.) into consideration. 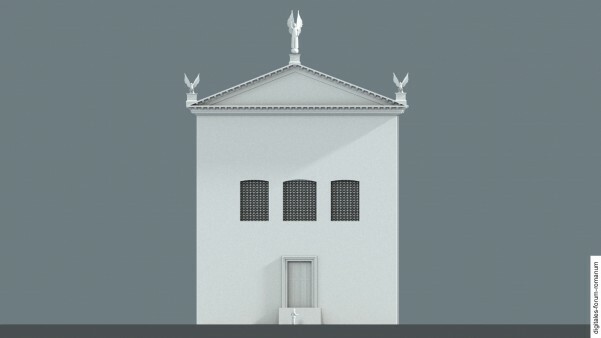 The latter displays the Curia as a towering building with a gabled roof, a door located in the middle and three window openings in the upper half of the facade – just like the Tetrarchic structure. However, it is unclear whether there was an arrangement of pillars in front of the lower part of the Curia, as the depiction of the coin seems to suggest. 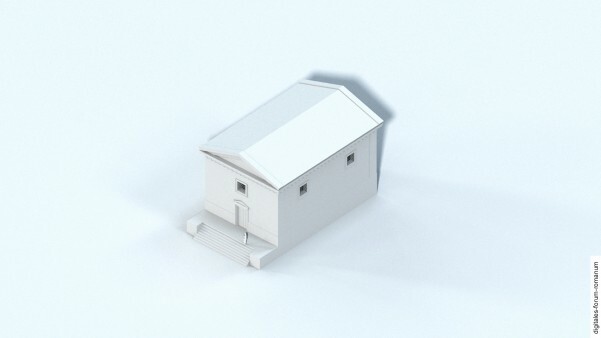 Common reconstructions of the Curia Julia incorporate these into the structure of the building, even though the Tetrarchic building provides us with no evidence of their existence (and in light of the close resemblance of the restored Curia to its Augustan predecessor it seems plausible to postulate that they were “inherited”, if they in fact existed on the south side of the Augustan Curia). Another issue that is debated is whether the depicted portico can be identified with the portico located north of the adjoining Forum of Caesar or not. This immediately prompts the question whether the entrance of the Curia Julia, which is depicted on the coin, was situated on the north side (rather than the south) or not. 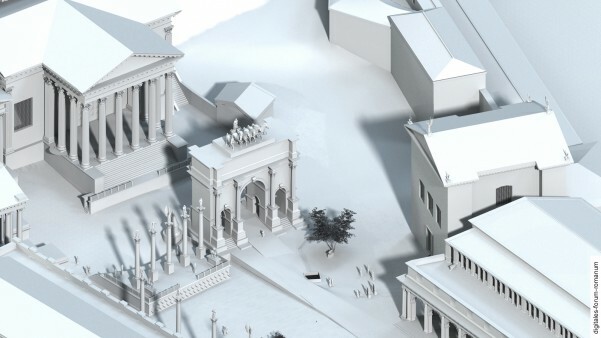 If it is true that the portico was on the north side, the building of the Senate would not have been primarily orientated towards the old Forum of the Roman Republic, but towards the newly built forum of the dictator perpetuus Caesar. 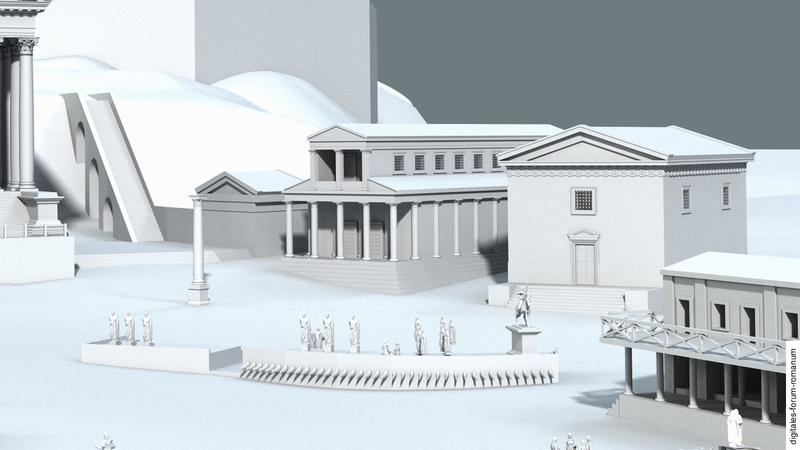 The rebuilding of the Curia Julia in the Tetrarchy seems to have been influenced – to a large extent – by the Augustan predecessor structure, which had been destroyed by a fire. Merely the installation of avant-corps on the corners and the inward indentation of the longitudinal walls can be interpreted as attempts to stabilise the building, which introduced deviations from the Augustan structure. The building was about 28 m long, 25 m wide and 30 m high. The Curia from the Tetrarchy had door openings on the south and north side respectively: A main door on the south side and two doors on the north side. The decoration of the entrance, which was orientated southwards, seems to have been a reaction to the increasing significance of the Comitium in the course of the reshaping of the Forum during the Tetrarchy, after the Comitium had only been of secondary importance for representational purposes on the Forum since its destruction in the 1st century B.C. C. M. Amici, Lo scavo didattico della zona retrostante la Curia (foro di Cesare). Campagne di Scavo 1961-1970 (Rome 2007). A. Bartoli, Curia senatus. Lo scavo e il restauro (Rome 1963). F.A. Bauer, Stadt, Platz und Denkmal in der Spätantike (Mainz 1996) 7-11. F.A. Bauer, Stadt ohne Kaiser. Rom im Zeitalter der Dyarchie und Tetrarchie (285-306 n.Chr.). in: T. Fuhrer (ed. ), Rom und Mailand in der Spätantike (Berlin 2012) 12-18. F. Coarelli, Il Foro Romano I. Periodo arcaico (Rome 1983) 133-134, 149-160. F. Coarelli, Il Foro Romano II. Periodo repubblicano e augusteo (Rome 1985) 135, 236-237. F. Coarelli, Curia Hostilia, in: E.M. Steinby (ed. ), Lexicon Topographicum Urbis Romae I (Rome 1993) 331-332. G. Fatucci, La Curia Iulia. Una proposta di ricostruzione, Workshop di Archeologia Classica 6, 2009, 113–121. H. Knell, Bauprogramme römischer Kaiser (Mainz 2004) 38-41. C. Morselli – E. Tortorici – C. Alvaro, Curia, Forum Iulium, Forum Transitorium, Lavori e studi di archeologia (Rome 1989). B. Steinmann – R. Nawracala – M. Boss, Im Zentrum der Macht. 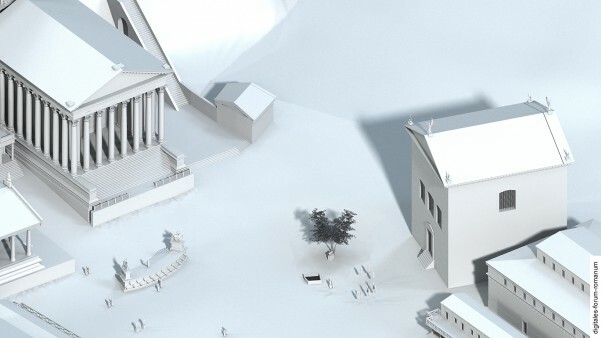 Das Forum Romanum im Modell (Erlangen-Nürnberg 2011) 124-127. L.R. Taylor – R. T. Scott, Seating space in the Roman Senate and the Senatores Pedarii, Transactions of the American Philological Association 100, 1969, 529-582. E. Tortorici, Curia Iulia, in: E.M. Steinby (ed. ), Lexicon Topographicum Urbis Romae I (Rome 1993) 332-334. R.B. Ulrich, Julius Caesar and the Creation of the Forum Iulium, American Journal of Archaeology 97, 1993, 49-80. 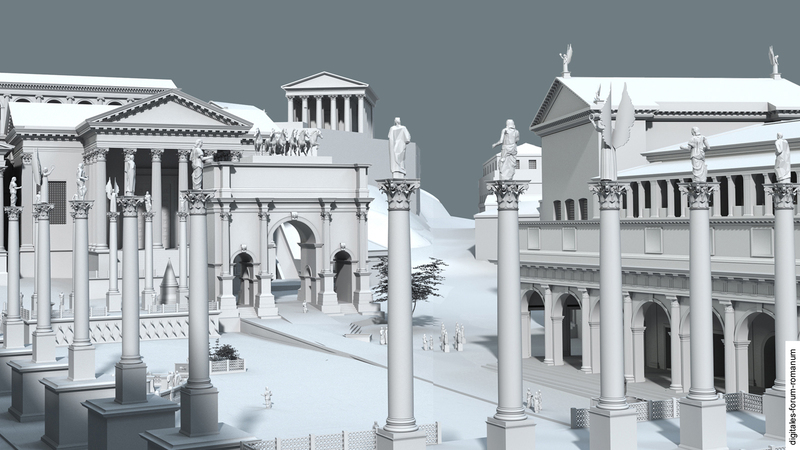 P. Zanker, Forum Romanum. Die Neugestaltung durch Augustus (Tübingen 1972) 8-11. P. Zanker, Augustus und die Macht der Bilder (München 1987) 80-88, 97-101.